Forget the mountain of unread emails, forget the boss, forget the morning commute: it’s time to get away from it all. After all, you deserve it for hustling so hard during these past winter months. But before you shove all manner of things into your suitcase and leave a week’s load of food for your cat, firstly whip out your smartphone and consult the plethora of apps available to help plan your escape route. No doubt one of the most important factors in your booking consultation is the accommodation – and, with a bustling array of booking apps designed to help you analyse the competition and cut through the hassle to help you find the best deal, booking a hotel has never been easier. Here, then, to hold your hand through this delicate process is TechWeekEurope’s guide to 10 of the best apps for hotel bookings. Currently running a slew of adverts that humorously uses the company name as a substitute for a bad word (“This is what you booking needed!” being one such quip – it’s subsequently triggered 2500 complaints), it’s an apt reminder that Booking.com is an ambitious and emerging frontrunner in the travel website game. Their reliable app is a case in point: an accessible platform available on both App and Play Stores, you can search across a wealth of options for hotels in your desired location and find the best rates, all with a simple tap of your smartphone. 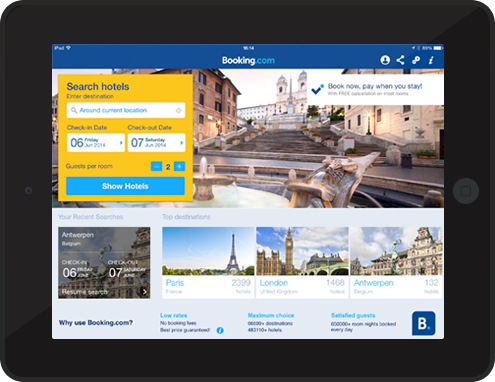 With options for travel flexibility (such as adding or cancelling a night), online check-in, and syncing your mobile searches with your desktop browsing, Booking.com’s app really is rather booking good. “The world in your pocket” is eBookers’ slogan of choice, and, to be fair, they’re not that far off from the truth. Their app is a free service, once again available on both App and Play Stores, that allows you to search all across the world for any kind of hotel – from 5* luxury to, er, a shed (maybe) – and then, once you’ve found an agreeable room and price, easily book it. With further options available to book flights and hire cars, eBookers is particularly handy if you’re a frequent traveller: their ‘Bonus+’ reward programme opens the door for money off future bookings. Swish. WorldMate wants to be your friend, especially if you travel regularly for business. Already at the service of over 10 million business travellers worldwide, this booking app acts like something of a personal organiser on the travel front. 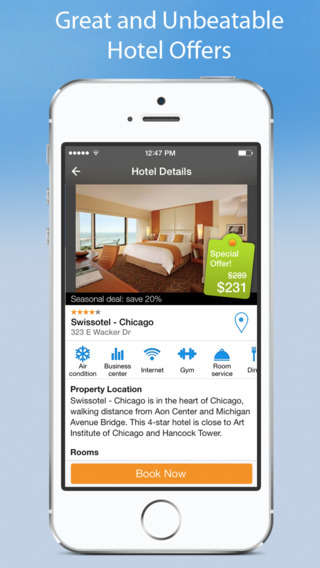 Primarily a smart itinerary – you can forward all of your travel confirmations to WorldMate and it’ll condense them into an active, real-time planner – it also has the capabilities to search for hotels based on user recommendations, allowing you to book a room at a better price than you’d apparently find elsewhere. Equipped with an intriguing additional feature that tells you if you’ve crossed paths with your LinkedIn contacts – so you can “schedule an impromptu meeting or dinner”, if you’re forward like that – WorldMate definitely serves the business clientele well. 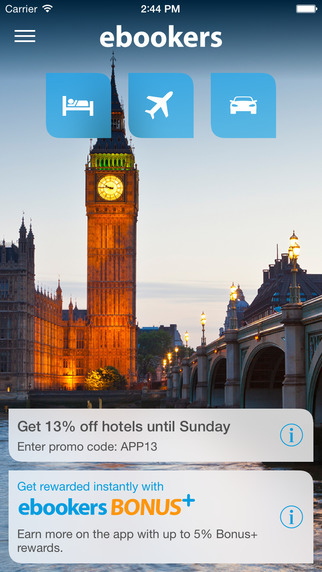 Another big hitter in the hip-happening travel website industry, Hotels.com’s app ostensibly isn’t too different from Booking.com’s – both are fine platforms, and it’ll most likely come down to personal preference in terms of choosing between them. But where it does differ is through its wide-scale availability on various app stores: as well as the usual App and Play duo, Hotels.com is available on both the Windows and Kindle stores. And its contents? Well, you can search and book a hotel from over 240,000 choices across the world, and access reservations even when offline – so, even if you’ve booked to stay in a shack in an off-the-beaten-track shantytown, you can still thrust your smartphone in the face of the confused local manning the reception desk/farmyard as a means of international communication. The kind of travel site that’s recently found its way to the top of the kind of Google searches that go a little something like “NEED CHEAP ESCAPE NOW”, Skyscanner is chiefly a rather handy service for finding and comparing worldwide flights prices. 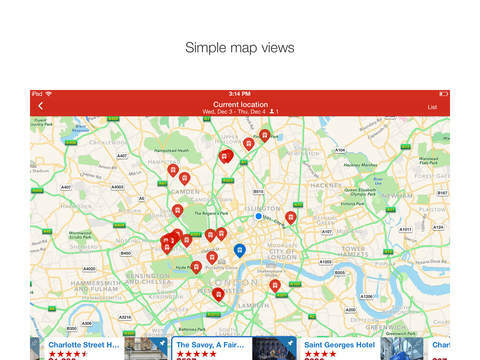 But this convenient app focuses instead on finding you the best hotels to suit your requirements: you can set filters based on cost, *-rating, and distance to the city centre. Armed with an attractive and interactive UI that gives you those all-important pictorial previews of the kind of room that you’ll be staying in, Skyscanner’s is a fine app to pledge your booking allegiance to. I feel like Hotel Tonight, Hotel Tonight! I wonder if their adverts rip off that delightful mid-90s jingle at all? They really should. Anyway: Hotel Tonight is another well-rated app available on iOS, Android and Windows platforms – a good start. Aiming to take the stress away from hotel booking, Hotel Tonight hand-selects the best hotels within your specifications (based on the notion that they are “the hotels we’d want to stay at too”) and enables you to book a room for the night within three taps and a swipe. They’re all about offering a better, streamlined and attractive mobile booking experience that helps you breeze through the whole process with little hassle. Now I really do feel like Hotel Tonight. No top-10 app list would be complete without an entry that features the lower-case ‘i’ prefix in its name, would it? And, just like that, here’s iHotel to keep that trend going. The offspring of HRS-Hotel Reservation Service, this booking app prides itself on providing an intuitive navigational service and the “highest user friendliness”. Find your hotel from a choice of 250,000 worldwide in just two steps (shouldn’t be too hard to narrow that down, surely), and then pay up to 50% less than regular internet travel sites for the pleasure, all thanks to a “special mobile tariff”. This is the niche entry in our list, but it perhaps speaks on behalf of luxury, technologically-able hotel brands everywhere. Conrad Hotels’ – an offshoot of Hilton – Concierge app is tailored to those who like to live life luxuriously by staying at their range of high-quality hotels across the world. Make a reservation at one of their restaurants, check out the guest room features at the Conrad Dubai (! 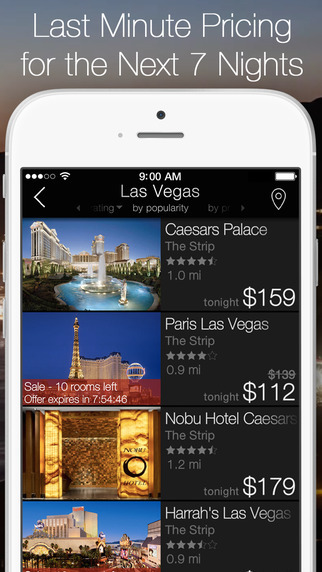 ), and even order room service – all by opening up this swanky, swanky app. And on the other end of the spectrum is the rather more modest, but ultimately far more wallet-friendly, lowcostholidays app. The offspring of the wildly-successful travel website, this app is a user-friendly and highly-accessible service that enables you to search across a wealth of hotels, hostels and villas in a range of locations – all within your specific budget and specifications, of course – to help you secure the perfect holiday deal. Perfect for booking a last-minute getaway to the sun, or for booking that hastily-arranged Stag Weekend that you’ve yet to organise. And rounding off proceedings is the less-well-known Roomlia, the brainchild of ex-Expedia workers Michael Reichartz and Jim Ferguson. Specialising in securing the best last-minute deals, this app allows you to compare prices for rooms up to seven days prior to your arrival in what is a very clear and unthreatening presentation – i.e. it doesn’t make you feel like you’re tied to this particular service for life. Still a growing service – more cities are becoming available on the app every month – it may well be worth your while seeing if Roomlia fits the bill the next time you want to quickly book a hotel getaway.